T H E BVI CO N T I N U E S TO R E M A I N G R E E N AS E VE R! SEALYON 37 – TH E I SL ANDHOPP ING DREA M VESSEL FOR EXP ERIENCI NG AL L T HE REGI ON HAS TO OFFER! HOW I S T H E BV I ’ S CH A RT E R YAC H T IND U ST RY D O I N G A F T E R H U R R I C A N E I R M A? Trust is not simply given. It grows. With investment services – as with so much in life – the more two people know each other, the better they work together. Which is why, in our personal financial advisory service, we believe time and attention are just as important as expertise and competence. Enabling us to be your trustworthy companion over the years, providing dependability and success. VP Bank (BVI) Ltd · VP Bank House · 156 Main Street · PO Box 2341 Road Town · Tortola VG1110 · British Virgin Islands T +1 284 494 11 00 · F +1 284 494 11 44 · info.bvi@vpbank.com VP Bank Group is based in Liechtenstein and has offices in Vaduz, Zurich, Luxembourg, Tortola/BVI, Singapore, Hong Kong and Moscow. THE ART OF LIVING Living in the British Virgin Islands means having an intimate relationship with the ocean and our tropical climate; they permeate our daily activities. Beach day or forest hike? North shore surfing or South shore marina? Tortola or Virgin Gorda? The choices are many and varied. Choosing to eat out could take you to one of numerous restaurants on several different islands with countless beaches and hidden coves, all an easy boat ride away ‐ power boat or sailing yacht ‐ you choose! WELCOME TO OUR APRIL/MAY issue of VIPY. Although the BVI is still recovering from one of the greatest catastrophes the islands have ever seen in surviving Hurricane Irma, our features this month testify to the resilience and restoration effort that has been ensuing since. Kicking off, we present an exclusive feature of stunning villa Little Bay. Located by the ocean, excellent panoramic vistas and an incredible atmosphere breathe extra beauty into this property, currently listed for sale with realtor Smiths Gore. We interview the owner about life in the BVI as an avid yachtie and the benefits of living in the region with arguably the greatest sailing in the world. We also showcase tips on selling property in the BVI with the aid of Bonnie Dougall Principal Broker of realtor ReMax. In Villas & Views this month, we offer more information on rebuilding after the hurricane. And following this, renowned architectural firm OBMI discuss post-Irma design, exhibiting both the great durability and unfortunate vulnerabilities of BVI structures. Company Green VI show us that despite the storm of September 2017 that shook the Caribbean, the Territory is still making speedy progress on the ‘green’ effort. Various partnerships, Government support, and optimistic planning is seeing the ambitions of Green VI become reality. With the greatest storm the BVI has ever witnessed now behind us, we investigate the charter yacht industry—debatably, one of themost appetising boasts the BVI has is the Territory’s sailing waters, reported by many to be the best in the world. We ask several charter yacht companies about business since Irma to hear some amazingly positive feedback. The Yacht Spotlight this issue bestows elegance onto our pages with Sealyon 37 – an exquisite yacht that combines stunning contemporary décor with powerful manufacturing, allowing the vessel to be the perfect transport for island-hopping. We hope to see her in the BVI one day soon. April/May’s issue concludes with an exclusive interviewintroducing Stella Maze, a luxury shoe designer who was born and raised on Tortola; her well established line is inspired by the Caribbean’s colours and splendour, making for an extremely attractive and unique style. We hope you relish these features and continue to push toward re-development and progress in the BVI rebuild. It’s all about growing bigger and better than ever before. Wishing you enjoyment of the LAND, SEA, and LIFE in the Virgin Islands. IS YOUR PARTNER IN THE REBUILD CTL Home Center is committed to the BVIâ&#x20AC;&#x2122;s post-hurricane rebuilding needs, offering lower prices and free consultations. Get accurate estimates for building requirements from our experts. We provide onsite visits and personal consultations. CTL Home Center is passing on tax-exempt savings to the whole community on building materials, lumber, plumbing and electrical supplies, household furniture, appliances and cleaning products. CTL Home Center is Your Home Of Savings! The Best Products at the Lowest Prices Period! Sara Sherman is a freelance writer, yogi, and accidental island girl living in St. Thomas, US Virgin Islands. SaraMSherman.com and IslandersFromIowa.com is where she resides. Smiths Gore’s Morgana runs a portfolio of exclusive villa rental properties. With years of experience in luxury hospitality, she works to ensure clients relish the very best of the BVI. Project architect Sian works for OBM International in the BVI office. 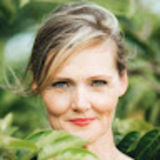 Her primary focus is in the Tropical Residential and Resort Design arena where she specialises and excels. Sales Director & Project Manager Originally from New Zealand with a background in brand management for three of New Zealand’s top-selling lifestyle magazines, Erin has strong understanding of sales and marketing within publishing. She brings a fresh approach to advertising in magazines and digital media. 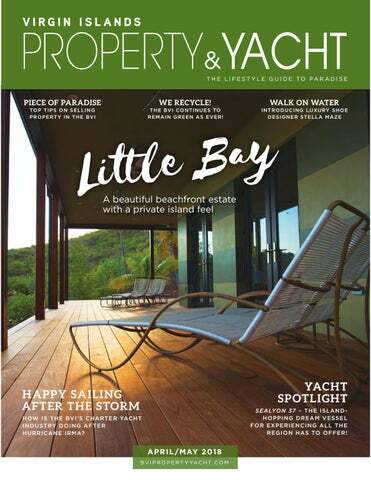 VIRGIN ISLANDS PROPERTY & YACHT is usually published eleven times a year (February, March, April, May, June, July, August, September, October, November & December/January), however, due to Hurricanes Irma and Maria, the magazine will temporarily be published bi-monthly (January, March & May 2018) and reviewed thereafter, by aLookingGlass Limited, Road Town, Tortola, British Virgin Islands. © Copyright 2018 by aLookingGlass Ltd. All pieces reproduced in this issue are under prior copyright by the creators or by the contractual arrangements with their clients. Nothing shown may be reproduced in any form without obtaining the permission of the creators and any other person or company who may have copyright ownership. Arawak Interiors offers home interior design advice, custom designs and sourcing from Asia, Mexico and USA. We also offer an extensive range of furniture, fixtures and fittings to choose from at our interior store and warehouse located in Road Town. Arawak Interiors manages all the shipping and logistics to deliver to your door anywhere in the BVI. Overseeing projects for Private villas, Private Islands, Resorts & Restaurants. Sealyon 37 – the yacht that pushes the charter vacation experience to the max! The BVI’s continued effort to remain green is as strong as ever! Yacht charter life and experiences following the immense storm of hurricane Irma! SECLUDED ESTATE, LITTLE Bay is an exclusive beachfront villa on Virgin Gorda with a private island feel, encompassing the Beach House and the separate Guest House at Camelia Point. Exquisitely stunning, panoramic views bless this property in abundance as it’s situated on the north-east arm of Virgin Gorda on the North Sound Channel, neighbouring YCCS and sitting across from Prickly Pear, Eustasia, and Necker Island. The geographical location is one of the highlights of Little Bay, emphasised by Little Bay’s owner Jack Setton who said, “It’s on the mainland of Virgin Gorda but it’s only accessible by boat, so it has that private island feeling of being exclusive…It has the best in views from Camelia Point and The Beach House…The North Sound is known to be the best neighbourhood...” Overlooking the North Sound Channel, decorated with its myriad of sail boats and cruising yachts, Little Bay’s vista includes Prickly Pear, Eustasia, and Necker Island. The owner—who is an avid boater—relayed that the location of the property benefits the yachtie lifestyle. “The North Sound is perfect for sailing,” he said. “The waters are so protected that all vessels from small hobie cats to big sail boats are safe.” From the property, the view panning to the right allows sight of Saba Rock and Bitter End Yacht Club, and to the left is Moskito Island and the coastline of Leverick Bay and Gun Creek. Comprising approximately seven acres of land, the property includes the Beach House with interior cover of 5,055 square feet and 1,350 square feet on the exterior, and the Guest House at Camelia Point with 1,500 square feet under cover. bedrooms and Camelia Point Guest House has two. The master bedroom features a curved 105-inch smart screen and a media console designed by Nathan Yong. All other bedrooms include 42-inch wall-mounted smart televisions; every area has Vitra Cork Stools. The Beach House has seven bathrooms. The Master bedroom has two bathrooms, for ‘him’ and ‘her,’ and a 72 x 36 Oceana Tub with aero massaging jets. Beds: 7 Baths: 7 Location Type: Beach access View: Beach and ocean views Power: Generator – 80KW FG Wilson. Residential Sales ‘As Is’ Post Hurricane Properties For Sale Since Hurricanes Irma and Maria, some of our property owners are selling their storm damaged homes ‘as is’. This is an excellent opportunity for those who have dreamt of owning a home in the BVI, looking for a renovation project, or wish to purchase an investment property. with expansive views of the north shore. Suffered damage to roofing, railings and windows and doors. Landscape gardens have been restored. One minute walk to Little Leverick Beach. Dock and views of North Sound Channel. Moderate storm damage to roof and windows. Paved driveway, pool and surrounding gardens. Extensive damage to roof and throughout. A full renovation is anticipated. Turpentine House, HAVERS HILL, TORTOLA Custom built villa with incredible views. Has lost decking and some roofing. Owner is very keen to sell. Original listing price $1.5 million. Reduced to $595,000 Stunning, eclectic property with separate guest house and studio cottage. Storm damage to roofing, decks and some windows. CHOOSING TO SELL your property is a major decision and sets off a vast series of events and tasks to be completed. How do you know the steps you’re taking are the correct ones in the right order? Armed with information, these tips from top BVI real estate expert Bonnie Dougall will help you get the best possible results from your property sale. or broker can then offer helpful tips on making the property as presentable as possible. They can help determine whether the property could be used for commercial or residential purposes, as well as assessing any dwellings for repairs or staging needed to set the property up for sale. All these things can affect the selling price. Sale Timing Real estate sales can be a whirlwind of details and tasks, and it’s important to have a realistic timeline in mind. B elonger to B elonger This kind of transaction will move more quickly than others. After banking arrangements have been made and the appropriate legal documents are drawn, the process will take only two or three months. Cash sales can move even more quickly than that. Non-B elonger to B elonger After requesting permission to sell from the BVI Government and appropriate documents are ready, expect at least two or three months for the sale to be completed. A month or two longer is possible with banking arrangements. Non-Belonger sellers would do well to obtain a copy of their Non-Belonger seller’s license. The number of beds, baths, and pools allowed on their license should match their property. If it doesn’t match, the Government can fine the seller up to 40% of the selling price. Island Marina Town; High Point Villa, Towers, West End, Tortola; Blunder Bay Land Site North Sound, Virgin Gorda; Outer Banks, Brewer’s Bay, Tortola. for approval. Once approval is received, the Governor must sign off on the actual license, which will take another month or two. This type of sale may take up to nine months total. Whatever decisions you make, you should strive to provide a safer and stronger home for you and your family. have to believe that we will not be hit with another category five hurricane, but still, we have to prepare for the worst case scenario. Get in touch with your insurance provider to discuss the planned repairs, what is and what isnâ&#x20AC;&#x2122;t covered, and how the repairs or rebuilding will affect your insurance coverage. Architects and Contractors If you want to rebuild your home stronger and safer, select architects and builders who have a reputable standing in the BVI. Get more than one quote for the proposed work to ensure you can benchmark the costs, but there is truth in the old adage that you get what you pay for. Talk to other clients who have had work completed by these contractors so you know they have a proven track record. Contact the local planning authority before starting renovations. They may have specific guidelines in place that you will have to follow and will make sure your work is safe, meeting all the requirements. who resides on Virgin Gorda: Given the widespread roof damage recorded in the last hurricane, it makes sense for homeowners to review their existing roofs to identify key areas for improvement to make them more resistant to storm winds. Having a structural engineer inspect the home, and make recommendations, can be the first step towards this goal. • OVERHANGS AND EAVES large overhangs and eaves are generally more vulnerable to damage than other areas of the roof. Consider reducing the size of these elements in a rebuild and insure that they are designed and anchored properly. kitchen cabinetry, this may be a convenient time to do so. Taking the time to research the options can even result in cost-savings over simply replacing what was there to begin with. Horticultural Craftsmen IDS works with local architects, home and business owners on residential, commercial and industrial in the BVI since 1991 projects in BVI. Our service ensures that the client’s project is designed to code and helps provide efficiency during the construction phase. ON SEPTEMBER SIXTH of last year, the British Virgin Islands were hit by a storm never seen before. Hurricane Irma, the most powerful Atlantic hurricane ever recorded swept through the islands with average winds of 185mph and gusts of 215mph. A couple of weeks later, Hurricane Maria seconded it, causing even further destruction. Besides huge material loss, the aftermath provided a need to re-examine architecture on the islands, so our isles could be more resilient and smarter when it came to deadly hurricanes. Hurricane Irma did and didn’t force a rethink of architecture. Yes, it was a huge eye-opener on what can happen when a major natural disaster ploughs through a community— its built environment, and natural landscape. It also showed us the perils of poor architectural design, construction, and outdated buildings in regard to current building codes. At the same time, it revealed the protection that a properly designed, programmed, and engineered property can provide. Although the hurricane laid bare the vulnerabilities of BVI structures and designs, it was a chance to review what withstood, encouraging of the strength of good design. As a reaction to the weaknesses we identified during and after the hurricane, we saw a dire need to refine areas of product specification and how these products are fixed to structures. Where appropriate, OBMI recommends specifications in line with Miami-Dade standards, because U.S. based codes in hurricane zones are more stringent than local BVI codes, which many times are not sufficient. We’re also providing additional detail when fixing components, especially in areas such as outdoor decking and guttering, so these can perform better in severe storm situations. another mega storm comes our way. Presently, clients are asking for safe rooms—concrete on all four faces with hurricane rated systems at openings and independent ventilation and communication— and the ability to operate off-grid and independently if the need arises. Kailua, Hawaii BeachsideLighting.com Rosie Nichols, USVI & BVI Rep. (340) 642-8981 Local installations include: Cooper Island, Peter Island, Saba Rock, Oil Nut Bay, and residences on St. Thomas, St. John, Tortola, and Virgin Gorda. sources of marketable products for use on-island or for export. Partnerships Partnerships are critical to the success of recycling, and so donors, who also work in close collaboration, supported Green VI’s initiative early last year of a recycling committee. This brings together the BVI Department of Waste Management, local recyclers, sponsors, and other stakeholders to help create true coalition and unity of purpose. Government As recycling success depends heavily on collection and transport to processing sites, the Department of Waste Management is an important partner in the recycling pilot. They will collect recyclables and derelict vehicles and facilitate some transport of these from the sister islands. of the recycling system. Thanks to Unite BVIâ&#x20AC;&#x2122;s seed funding and diligent advocacy, other generous donors have made grants available through Green VI to catalyse the system, including loans to entrepreneurs. another entrepreneur given support, will soon be making furniture from discarded plastic, expanding to the manufacture of polywood, which can be used to make a variety of products. Green VI and Unite BVI hope to assist more entrepreneurs to create businesses based on the resources of waste. The Virgin Gorda Community The Virgin Gorda Community has begun organising clean-ups, sorting their recyclables and some schools, such as Valley Day, and with guidance from Green & Clean VI Ltd., have begun composting organic resources. work since the storms. But through hands-on community participation, integrated management strategies, and new technology, the mosquito population has been reduced and held in check. Recycling Bins To replace the Department of Waste Management’s storm-lost recycling bins on Virgin Gorda, an attractive and functional prototype has been artfully made locally from used wooden pallets. As more recycling points are established, bins of varying types and sizes will be used, depending on the location. citronella, so vectors are repelled. The bags will be used for community clean-ups, recycling projects, and the new Adopt-A-Spot Programme. of various activities that transform waste resources into useful, locally made products; providing a rich environment for growing more BVI businesses. What Can You Do? Reduce, Reuse, and Recycle! Use reusable shopping bags and water bottles, buy only what you need, participate in clean-ups, Adopt a Spot, green your event, compost, and recycle! ■ For more information on the above and to find out what and where you can recycle, visit greenvi.org. Lifestyle Protection Satellite Television Call for satellite internet services via VSAT, Inmarsat, Iridium, Globalstar & 4G. Colonial Insurance (BVI) Limited is rated A-(Excellent) by AM Best. travel situation changed. The on-site team was phenomenal as well, handling a couple of small maintenance items nearly instantaneously. wished to ask is, what has happened to our charter yacht industry since Hurricane Irma? We talked to some renowned BVI charter yacht companies and their customers about how they’ve found business since the great storm that passed through the islands back in September 2017 and we were pleased to discover that life on the water is actually better than ever. favourite spots reopen, reacquainting themselves with local music, food, and fun. The Moorings The Moorings—who began in the British Virgin Islands nearly 50 years ago—reopened for business on December 9, 2017 and have been steadily ramping up their clientele since. The Moorings was pleased to quickly rebound from the storm with a huge investment in the fleet. Over the course of 2018 and into 2019, the company will be receiving a large number of brand-new yachts throughout the Caribbean to replace those yachts lost to the hurricane. They used this opportunity to make improvements to their marina facilities. in the BVI was exponential. We followed the islands’ recovery efforts on the internet and were excited to see that the area was making Herculean progress towards readying the cruising fleet, as well as favourite beach bars/ restaurants, resorts and hotels for the high season. “We moored at The Bight on Norman, Great Harbor on Jost VanDyke, Cane Garden Bay, Trellis Bay on Tortola, Leverick Bay on Virgin Gorda, and Great Harbor on Peter Island (no facilities, but still a lovely spot). Provisions were readily available, as are great meals in restaurants which, although severely damaged, have been rapidly rebuilt and are sporting fresh coats of colourful paint. class, friendly customer service, their guests have loved their charter experience in the BVI post-Irma. The visitors feel they’re contributing to the island’s recovery as well as enjoying quiet anchorages, still beautiful surroundings, and amazing sailing. Horizon reported that the crewed yacht charters are really busy at the moment as a lot of villa rental clients have opted for the luxury on-thewater all-inclusive experience. Caribbean food is what she misses most while living in NYC. Her island heritage comes through in all of her designs and brings a fresh new voice to New York’s high-fashion shoe scene. With her designs already in the pages of Harper’s Bazaar and Lucky magazine, she’s well established and continuing to innovate in her field. “I’m working on a collaboration with Skull Candy that will come out this summer,” said Maze, and she has her sights set on television. “I can’t talk about it right now, but keep your eyes open for Stella Hues on TV later this year.” ■ Stella Hues can be purchased at www. StellaHues.com. When wearing Stella Hues “Bleu Bottom” shoes, you can literally walk on water. DIGICEL iSEE, THE AFFORDABLE CLOUD-BASED VIDEO SURVEILLANCE SYSTEM FROM ONLY $49/MO. Fully compostable food and beverage containers available in wholesale and retail quantities. An extensive range of products including soak proof sugar cane food boxes, sturdy cutlery, paper straws and PLA cups. 14 acres of Freehold Waterfront acreage in South Sound, Virgin Gorda could be perfect for golf course, senior housing, eco-resort. Reef-protected bay neighbors tony Biras Creek, the jewel box villas of Oil Nut Bay, and Leverick Bay. This property has been held by the same family for over 100 years. Varied topography oï¬&#x20AC;ers multiple options for development. Exceptional parcel of FREEHOLD land located at intersection leading to exclusive Leverick Bay, the Gun Creek jetty, and Oil Nut Bay in South Sound, Virgin Gorda. SOL Y SOMBRA VIRGIN GORDA, BRITISH VIRGIN ISLANDS STEPS AWAY FROM Little Trunk Bay, this classic and timeless British colonial beachfront villa has five suites, each furnished with custom-made teak furniture. A great room, oﬃce/library, dining room and fully-outfitted kitchen oﬀer spacious and elegant entertainment areas. A 45-foot ocean-front infinity pool, observation deck and lighted tennis court are set within over an acre of tropical gardens. The property is proximate to The Baths, Virgin Gorda’s famous destination, and two unspoiled beaches, Little Trunk Bay and Valley Trunk Bay. A private movie theater, daily maid service, exercise equipment and gym and a chef (upon request) complete the villa’s oﬀerings.